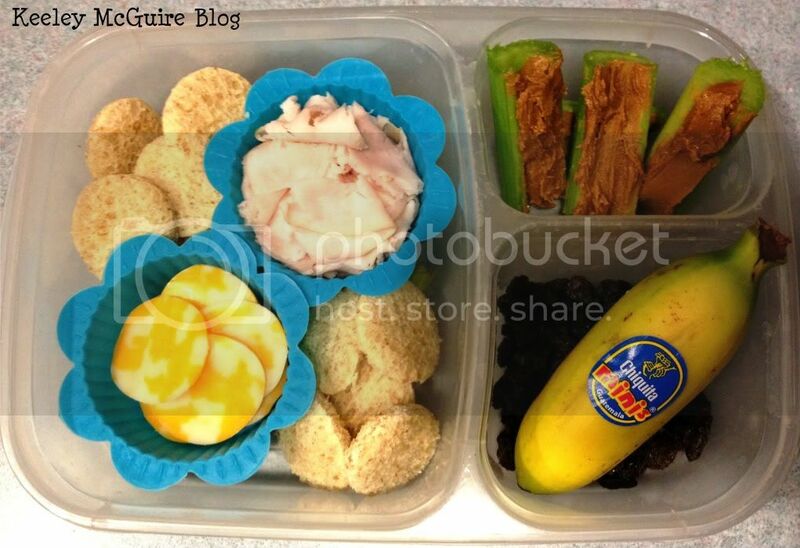 Gluten Free & Allergy Friendly: Lunch Made Easy: Back to School! Lunch Made Easy: Back to School! I cut out circular pieces of wheat bread, circular cheese pieces, and there's also a silicon cup with ovenroasted deli turkey in it to make "mini-sandwiches". Top right is four pieces of celery (one is tucked under the three you see) filled with Sunbutter. Bottom right is a Chiquita Mini-Banana and underneath it are raisins. I am going to have to copy your little circle breads. Those are sooo cute. I know my chicks would dig those! Cute, colorful lunch!